February -- Dental Health Month -- is the time of year when many teachers help students "brush up" on their awareness of tooth care. This week's lessons capitalize on that once-a-year "teachable moment." Included: Five lessons students can sink their teeth into. Dental Health Month provides teachers with a month full of great curriculum connections. In the primary grades, where the emphasis is on taking care of their teeth, teachers can encourage good tooth care habits. 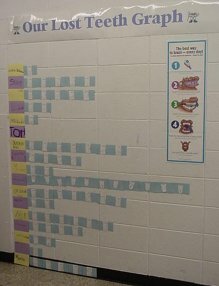 First-grade teachers, in particular, can create a class graph, so students can keep track of teeth lost throughout the year. They might even join this year's Tooth Tally Project. In addition, Dental Health Month offers younger students the opportunity to share some fun read-aloud books (scroll down the page for booklist). While we were searching the Internet, Education World editors collected a wide variety of additional activities for teaching about dental health. Click for more lesson ideas. As students move up the grades, hands-on experiments are a great way to drive home the importance of tooth care. Creating a timeline of dental history is another great curriculum connection. Many great Web sites also are available to help you teach about teeth and dental health.